At 6:30pm PST today Bill Gates will walk onto the stage at CES 2008 and deliver his final keynote address as chairman of Microsoft. We look back at how it all began, the highs and lows, and try to figure out what the future will bring. Bill Gates wasn't the most obvious choice to address the Consumer Electronics Show (CES) in 1998. At the time, Microsoft was best known for Windows, Office and other PC offerings, and many thought a keynote from a major electronics player, perhaps Sony, would have better suited the CES audience. The organisers knew what they were doing, though. Microsoft had already begun to branch out from PCs with the release of Windows CE 1.01, the cut-down version of Windows behind the latest PDAs. And the company was talking about embedding Windows CE in everything from stereos and fridges to cameras and your car. It was planning to deliver a whole new generation of super-intelligent gadgets - they'd even communicate with each other, finding new ways to make your life easier. CES needed this vision, then. Especially coming from a man who already had such a reputation for innovation and marketing success that he really might be able to pull it off. And Gates felt he needed CES to gain the attention for his new consumer products. The stage seemed set for a beautiful friendship. A Bill Gates CES keynote always includes several predictions about the future for gadgets, so we've now got more than enough material to assess his fortune-telling ability. And, well, it's not looking good. Gates has scored a few minor hits. He realised the importance of in-car satellite navigation systems back in 1998, for instance, with Microsoft Auto PC. 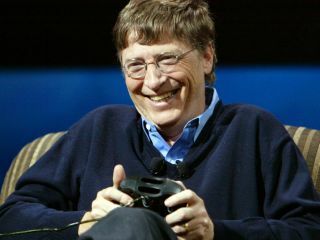 Gates has always recognised that wireless networks are key for consumer electronics, and in 2000 explained that we'd soon be able to stream music wirelessly around the house. That might sound more impressive if Gates hadn't also told us in 2000 that the eBook market was about to explode, handwriting and speech recognition would be perfected by 2003, and that washing machines will routinely communicate with your PC by 2010. Uh-huh. Then there were the dubious product initiatives. Remember the "smart" Microsoft SPOT watches that could display traffic reports, share prices and other real-time information (if they'd actually worked)? You missed nothing. Mira intelligent displays were scarcely any better, and Urge, the much-trumpeted music service partnership with MTV, folded 18 months after it was announced. For sheer technical disasters, though, nothing could beat CES 2005. The audience watched as an uncomfortable Gates failed to get Media Center to display a slideshow, a new Xbox game crashed with a memory error, and a Tablet PC lost internet access and was unable to fetch a TV programme guide. Highs, or lows? You decide. If CES audiences have seen little benefit from Bill Gates' vision of the future, can we at least say they've been entertained? Not entirely. Despite delivering these addresses for many years, Gates remains at best an average speaker, who stands little or no chance of inspiring an audience. And that's even with a string of irrelevant special guests, from WWF's The Rock, to talk show hosts Jay Leno and Conan O'Brien, and even Justin Timberlake. Now the Gates keynotes are over, though, at least for the moment, the question arises: who's next? Apple CEO Steve Jobs is one suggestion, and he's definitely a more polished performer, able to hold attention easily and better able to respond to individual audiences. But is Apple really better placed than Microsoft to provide an industry-wide view on consumer electronics? We'd say no - if only because Jobs likes preaching to the converted at Macworld Expo, which starts once CES is finished. In our view the 2009 address will stay with Microsoft, and for his previous experience in the event it will be given by Robbie Bach, president of Microsoft's Entertainment and Devices division. But this victory may only be temporary. Bach is a better speaker than Gates, but doesn't have his legendary status, and that means he'll need to deliver, right away. The world will be watching, and CES keynotes do not belong to Microsoft by right.